Kristi Wysocki presented her frst USDF Sport Horse Seminar for the new england Dressage Association in 2009. to prepare, she was given an envelope containing four magazine articles and fve drawings for the overhead projector. days of classroom work and live demonstrations. There’s a big demand for this seminar, which is required for United States equestrian Federation DSHB “r” candi- dates, and the numbers tell why: in 2014, there were more than 60 shows in the Great American insurance Group/ USDF Breeders Championship Series—and only 13 USEF DSHB “r” and 20 DSHB “R” judges. The three most important aspects to consider in evaluat- ing gaits are purity, correctness, and quality, Solyntjes and Wysocki said. Purity refers to how well the gait adheres to the correct rhythm. Correctness is refected in straightness, evenness of strides, levelness (limbs lifted to a symmetrical height), and alignment. Quality is the “wow” factor, encom- passing volume, amplitude, elasticity, tracking, and articu- lation of the joints. A horse with good movement should use his entire body, not just his legs. The walk is a four-beat gait. When viewed from the side, the hind limbs should form an inverted V, and the front foot should “appear friendly” with the hind foot, as the pre- senters put it, meaning that the front foot should leave the ground only when the hind foot is close by. Dressage and DSHB judges penalize a lateral walk—in which the rhythm becomes unclear—severely. The trot is a two-beat gait. When viewed from behind, the hocks will turn in and the stife turn out very slightly to allow greater clearance between the stife and the barrel. The canter is a three-beat gait. A four-beat canter is a serious fault because it lacks the required moment of suspension, during which time all four limbs are airborne. 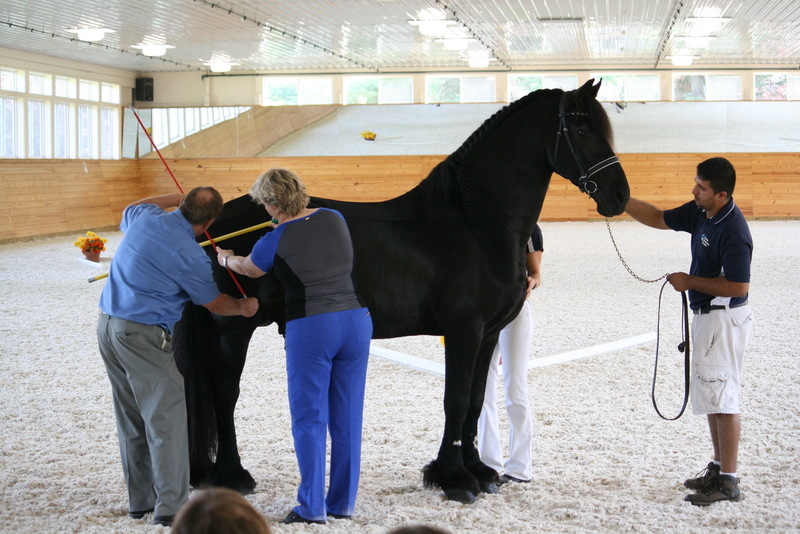 Troughout the presentation, Wysocki and Solyntjes referred to the horse’s temperament as the “fourth gait” because of its importance in both breeding and riding stock. Use your knowledge of conformation and gait analysis every day as you work with horses, the presenters advised the audience, both in evaluating prospective purchases or breeding stock and in assessing existing training and sound- ness issues. The live demonstrations at iron Spring Farm gave partici- pants the opportunity to practice their skills in critiquing conformation and gaits. The frst group was young horses—a two-year-old warmblood gelding and a yearling Friesian colt. Tey were followed by fve stallions ranging in age from 10 to 21 years. Te stallion group consisted of two Friesians, a Westfalen, a Toroughbred, and a tB/Connemara cross. After the participants evaluated a group of mares, the day concluded with an under-saddle demonstration. Te fve-year-old German Riding Pony, fve-year-old Hanoveri- an mare, and four-year-old oldenburg gelding gave the au- dience the opportunity to evaluate and compare the move- ments of three very diferent types of horses, as might be found in a suitability or Materiale class. On the second day of the seminar, the focus switched to judging, with the presenters giving an overview of the format of the Great American insurance Group/USDF Breeders Champion- ship Series and discussing the rules governing DSHB classes. Solyntjes and Wysocki led the group through an analysis of the score sheets, noting the diferences among classes for sport- horse breeding stock (mature horses) and for sport-horse prospects (young horses and classes for individual breeds). Tey then discussed the process of judging horses in hand on the triangle, followed by explanations of how the under-saddle classes (Materiale and suitability) are judged. The afternoon session at iron Spring Farm gave participants a chance to practice their judging. Small groups started by judging a Materiale class, followed by in-hand classes ranging from foals of the current year through older mares and a Get of Sire group. During the in-hand judging, both Wysocki and Solyntjes advised waiting until after the horse moves to judge the back and loin when one young mare received a rather low score from the participants. Te presenters, who awarded the mare a score of 8.3, noted that the correctness of the loin can be evaluated only when the horse moves. Another example of the intricacies involved in judging came when a mare presented had a slight toe-in. Although the participants marked her down for the conformational fault, the presenters noted that the mare landed fat when she moved, so correctness of movement trumped the slight defect. Penny Hawes is a freelance writer specializing in the equine industry. She lives in Virginia and is an active volunteer at dressage shows, including scribing for several breed shows. Visit her website at TeHorseWriter.com.